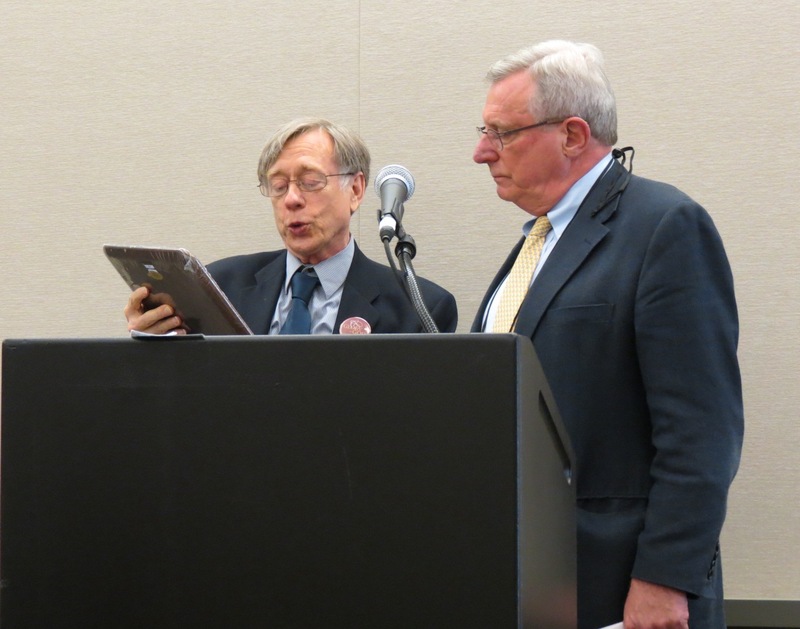 PITTSBURGH (July 5, 2012) – The Presbyterian Writers Guild sponsors a General Assembly luncheon biennially and issues awards for distinguish writer and first-book. At this year’s luncheon the Rev. John M. Buchanan was named winner of the 2012 David Steele Distinguished Writer Award. The award is given to a writer who has distinguished himself or herself in journalism, literature or scholarly writings. Buchanan has written books, including A New Church for a New World; Being Church, Becoming Community; and Sermons for the City, sermons and weekly columns as editor and publisher of The Christian Century. Linda Valentine was there to say a few words about her friend and former pastor from Fourth Presbyterian Church in Chicago, Buchanan, who retired at the end of January after 48 years of ministry. Valentine was present at his retirement. “Buchanan was present at our children’s baptisms and confirmations”and throughout the time she and her family were members at Fourth, Valentine said. See text of her full remarks below. Jack Haberer, editor and publisher of The Presbyterian Outlook said, “I don’t think of John so much as a distinguished writer, but as a distinguished pastor.” For four decades Buchanan has been pastor of the one of largest churches in the PC(USA) “and the church is still growing,” Haberer said. The Presbyterian Publishing Corporation’s First-Book Award recipient is the Rev. Kenneth E. Kovacs, for his book The Relational Theology of James E. Loder: Encounter and Conviction, published in 2011 by Peter Lang. Judges said he won for superior writing skills evident in this effort to make a scholarly work understandable and interesting. Kovacs started his acceptance speech by telling about a dream he had three years ago, in which he saw papers from a box of his, blowing away in the wind. He felt this dream was referring to his 500-page Ph.D. dissertation that was put away in a box collecting dust. “It was then that I contacted a publisher,” he said. Also announced this year is the Jameson-Hines Scholarship for Presbyterian students, graduates or under-grads enrolled in an accredited college, university or seminary. If you are planning or willing to write for the church through books, poems, blogs, news reports, feature stories, editing or curriculum writing, apply through PWG, janedhines1@gmail.com. The maximum scholarship amount is $5,000. The Distinguished Writer Award carries a monetary grant of $1,000, plus travel and expenses to General Assembly. The 2009-10 winner was Eugene H. Peterson, author of more than 30 books including The Message: The Bible in Contemporary Language (NavPress Publishing Group, 2002). The Presbyterian Publishing Corporation’s First-Book Award, formerly called the Angell Award, is given to Presbyterian authors of fiction, non-fiction, theological, how-to, photos with commentary, etc.– but should be the first-ever published book. The 2010 winner was Rebecca Barnes-Davies for her book, 50 Ways to Help Save the Earth: How You and Your Church Can Help Make a Difference (Westminster John Knox Press, Louisville, KY).